The number of pterosaur specimens now known from the Solnhofen is very impressive, certainly in the hundreds, although with a good number sitting in private hands, plenty of information is kinda known about, without necessarily being in the literature. However, while it is easy to bemoan the inaccessibility of material that isn’t in museums, far too much that is available is not always looked at, and a great case in point is the collection of Solnhofen material in the Carnegie Museum in Pittsburgh. In the early 1900s, the Carnegie was able to acquire a large collection of fossils from a Belgian collector the Baron de Bayet, and this included considerable amounts of Solnhofen fossils including a dozen pterosaurs. This is arguably the best collection outside of Europe, or even outside or Germany, and includes material in 3D, with soft tissues, stomach contents and other rather nice details. However, in the following hundred years a total of just 10 papers even mention these specimens, and some of these are very much references in passing. The only even vaguely detailed mentions come from Peter Wellnhofer’s works from the 1970s, which are not easy to access these days, often available only with poor images, don’t illustrate all the specimens, and came in many cases prior to additional preparation or other modifications. In short, this is a major collection of pterosaurs which needs to be revisited. While visiting Mike Habib in Pittsburgh, we were hunting for things to do and realised this was an area ripe for reappraisal and set to revising and updating the material. Joining forces with Carnegie curator Matt Lamanna, we have now published a long paper (appropriately enough in the Annals of Carnegie Museum) detailing the material and its history. Naturally we have not done detailed descriptions of the anatomy of the pterosaurs at hand – there are very good descriptions of things like Rhamphorhynchus and adding to that would merely fill space without really conveying much useful information, so instead we focused on what is unique about each specimen (taphonomy, condition of the material, what is and isn’t present) and specific history of the material in places. For completeness, we even briefly covered the casts in the collection, and the skeletal models made by Wellnhofer when he was in the museum on a sabbatical many years ago. This still resulted in a manuscript of over 15 000 words (despite there being only a handful of references) and 15 figures (at least one of each specimen), while Mike rather heroically took dozens of measurements for each specimen and then repeated the exercise for accuracy. The paper is in black and white, but colour versions of the key figures are online here alongside the data. Some of these specimens turned out to be much more interesting and potentially important than previously realised and we were also able to correct some previous problems and update the taxonomy. Recent revisions especially to the pterodactyloids has left a lot of collections lagging in their taxonomy, but there was also a large animal that was listed as Rhamphorhynchus, despite obviously being a pterodactyloid, and indeed actually doesn’t even bear much resemblance to any currently known Solnhofen pterosaur and is rather cryptic. Two specimens had been mistakenly thought to be a plate and counterplate and had been combined even though they were quite different. After much head scratching we realised the issue was that there was a plate and counterplate there, but thanks to effectively a typo, the wrong pair had been put together. 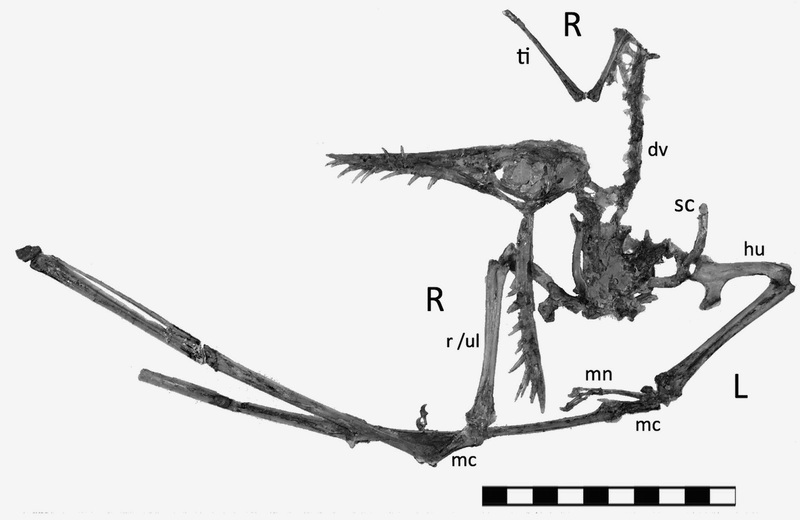 Two specimens of Rhamphorhynchus have undergone pretty dramatic changes in recent years, having been fully prepared free of their matrix. In one case, this results in a very odd flat specimen (which is apparently now very fragile – I actually didn’t see either of these, they were away when I was at the Carnegie) but that is at least cleaned up, but the other is a near complete skull preserved in 3D. 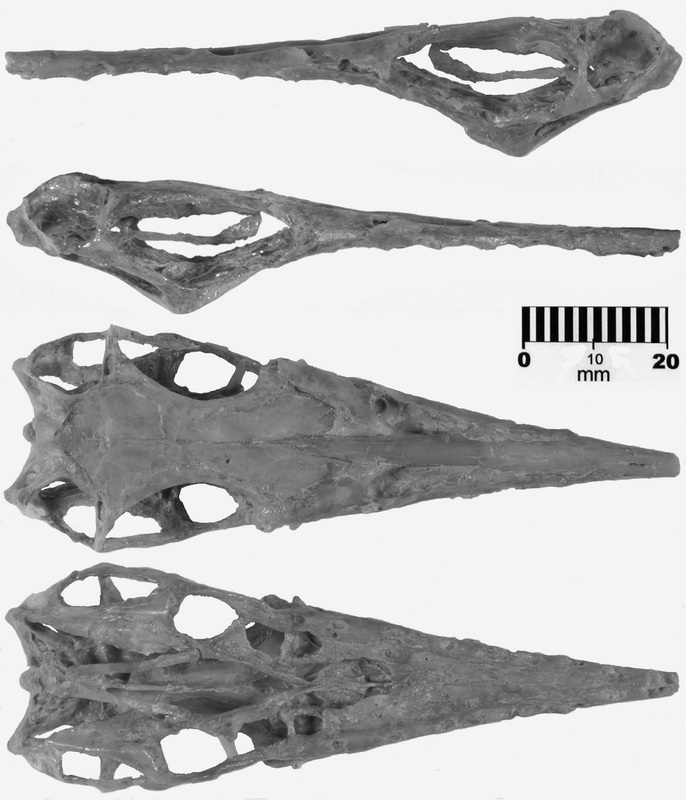 Many readers will remember the paper on pterosaur neuroanatomy led by Larry Witmer that compared the brain structures of Anhanguera and Rhamphorhynchus and this specimen was responsible for the data on the latter. Three dimensional material from the Solnhofen is not common, so a skull that is in 3D and prepared to the point that it can be seen in all views is a real treasure and while it has been scanned, we’ve included a series of large photos of it to help reveal the structure. Several specimens show traces of soft tissues including the wings, throat sacs and tail vanes. None are especially well preserved, but nor ore these features that common either (in part perhaps because like the leg feathers of Archaeopteryx, they may have been destroyed in the past to ‘better’ prepare specimens), so any additional information is useful. Finally, one of them does appear to have some fish teeth associated with the stomach. 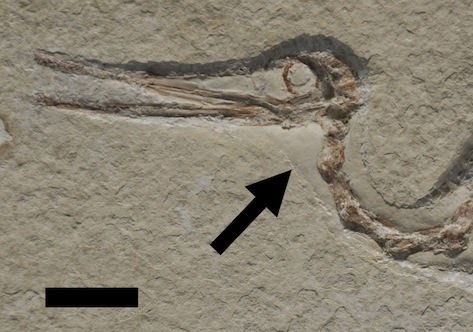 We this is has been missed before by other people and so is a novel find, and that extends the set of Rhamphorhynchus specimens with fish gut contents and firms up the evidence for piscivory as a major part of the diet of these animals. Hopefully therefore this paper will clarify a few issues with the collection, bring forwards some of the developments and details not previously seen or recognised and provides a basis for future research. Also of course it marks the beginning of the sad death of Matt Lamanna’s career as a researcher of dinosaurs and the slow and painful descent into working on pterosaurs and consorting with the kinds of people who actually quite like them. For this Mike and I can only apologise, or cackle wildly with unabandonned joy, depending on who is reading at the time. Hone, D.W.E., Habib, M.B. & Lamanna, M.C. 2013. An annotated and illustrated catalogue of Solnhofen (Upper Jurassic, Germany) pterosaur specimens at Carnegie Museum of Natural History. Annals of Carnegie Museum, 82: 165-191.Link to PDF here. - Support Bank BCA - BNI - BRI - CIMB - Mandiri.